Do you love sending text messages to your friends and love ones? Are you fond in giving your partner an inspirational and encouraging love quotes before his/her day starts or even before he/she sleeps at night? Are you an avid love quotes compiler or collector? Well here it is guys, here's the post you're looking for. An article made for those group texter fanatics out there. A compilation of the most sweetest romantic love quotes you'll ever read. All you have to do is copy your chosen quotes below and rewrite it on your mobile or smartphone and there you are, a sweet noting for the one you treasure the most. This compilation of romantic love quotes are written in three languages, 'Tagalog, English and Taglish,' it's up to you if what on the three languages do you prefer to use. So to everyone, enjoy reading and texting. "To love is one thing. To be loved is another, but do you what's best? That is, to be loved by the one you love is everything." "Sabi nila, mahirap daw maghilom and pusong nasugatan lalo na kung ito'y gawa ng taong mahal mo. Sabi ko naman, hindi ba mas mahirap yung magmamahal ka ng isang tao kahit na alam mong mahal mo pa yung nanakit sayo?" "There's no such thing as coincidence. I believe that people met for some reasons. But whatever that reason maybe, I'm happy to have met you, it only means that destiny truly exist. Oh! come on, hindi pa ba obvious? We're destined. :P"
"Ang PAG-IBIG ay parang HOLDAPAN .. Nasa sa’yo ang desisyon kung ika'y makikipag patayan .. Or you'll give up, kasi takot kang masaktan." "My Lips wants to KiSS YOU. My Eyes wants to SEE YOU. My Hands wants to TOUCH YOU. Every part of me wants YOU. Ano ba yan, kasi nga I LOVE YOU!! :'>"
"There are things that only our hearts can see, kaya don't be surprise if sabihin ko na mahal kita nun pang hindi kita nakikita. Sadya lang talaga na nauna kang nakita ng puso ko bago ng mata ko. :)"
"Love can never be wrong, sabi nila. Most people blames the situation and even the person. Sabi ko naman, kasi sino pa ang sisihin mo, kung hindi sayo, HINDI SAYO!!" "Do you believe that 'CHANGE' is the only permanent thing in this world? Ako, hindi .. mas permanent kaya ang love ko sayo. But if magbago man ito, I bet hihigitan lang nito yung noon sa mga susunod pang mga taon. tama!!" "Of all the treasures I have receive living in this complicated world, yung 'MINAHAL KITA TAPOS MINAHAL MO RIN AKO' ang pinaka precious sa lahat." "I don't have anything in this world para ialay sayo. I don't have even a single piece of gold nor a pearl to give you. But there's one thing I have na pwede kong ialok sayo. Ang 'PUSO' ko .. pwede na ba un para mahalin mo ako? 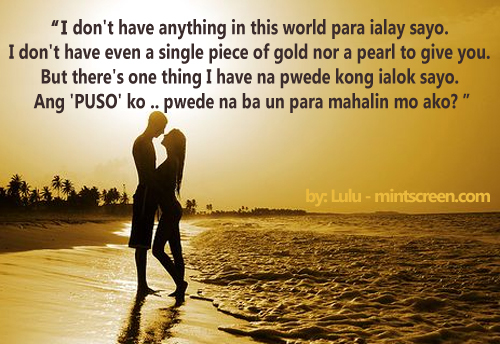 --> by: LULU"
This are just few of those many love quotes out there. If you guys have thier own set of favorite love quotes, write it down on the comment section below so you may also share to everyone reading this post. Lets make it trend, share this to your Facebook walls, Twitter feeds and Google+ it, so people may know to find the best compilation of love quotes ever. Comments or suggestions about "Romantic Love Quotes and Encouraging SMS text messages" is important to us, you may share it by using the comment box below.